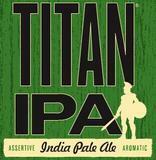 Great Divide brews Titan IPA for hop disciples — independent beer drinkers seeking out robust, flavorful beers characterized by their abundance of hops, flavor, aroma and bitterness. As a big aggressively-hopped India Pale Ale, Titan IPA fills this bill — beginning with piney hop aromas and citrus hop flavors, and finishing with a rich, malty sweetness that is carefully balanced with crisp hop bitterness. 65 International Bittering Units (IBUs).